This is the book that I hand out to every parent I meet who is struggling with some sort of extreme picky eating. It’s a problem that can be frustrating, terrifying and wildly isolating – even feeding kids is a topic that our culture has incredibly clear ideas about. 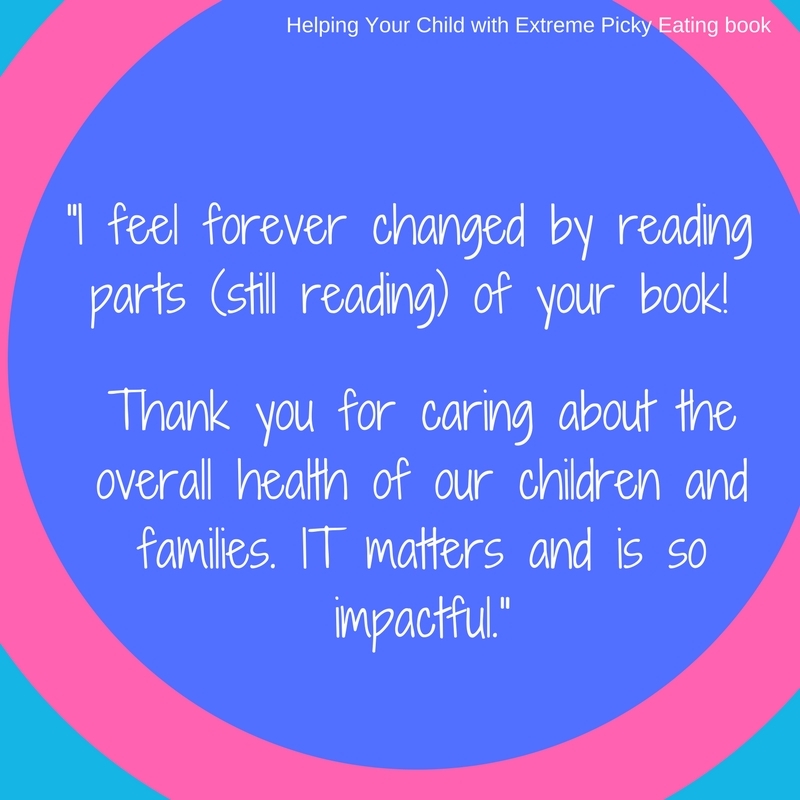 Rowell and McGlothlin navigate the larger cultural issues with respect, empathy and thoughtful insights, while also offering exactly the kind of practical, evidence-based advice that parents desperately need to help them navigate the particulars of their picky eating situation. Parents are so often told what they’re doing wrong when it comes to feeding their kids — here is a book that tells them what they can do right, without judgment or apology. A must-read for anyone who feels anxious about family mealtimes. I wish there was a way to have known about this method before attending intense feeding therapy. They did help us every step of the way and they truly cared but protocol was one of the hardest things we ever faced. I did experience therapist putting expelled food into my daughters mouth and I hated that. It was part of the process. I loved the people but this method cost our family so much heartache and turmoil. The real hard work began after the 8 week intense therapy when we were home without help and doing protocol. One other thing about intensive therapies is that I had to advocate for “real smoothie drink and healthy food” vs canned food or protein shakes. I feel forever changed by reading parts (still reading) of your book. THANK you so much! Throughout this easy-reading material are practical “food for thoughts” to help put into perspective what it is the child is potentially (most likely) feeling when faced with eating something new. Along with helping the reader empathize with the child, the authors also write the book in a way that empathizes with the “food provider”, and in a non-judgmental respectful manner. For those out there who are tired of the power-struggles surrounding food and meal-times, this book is for you!! 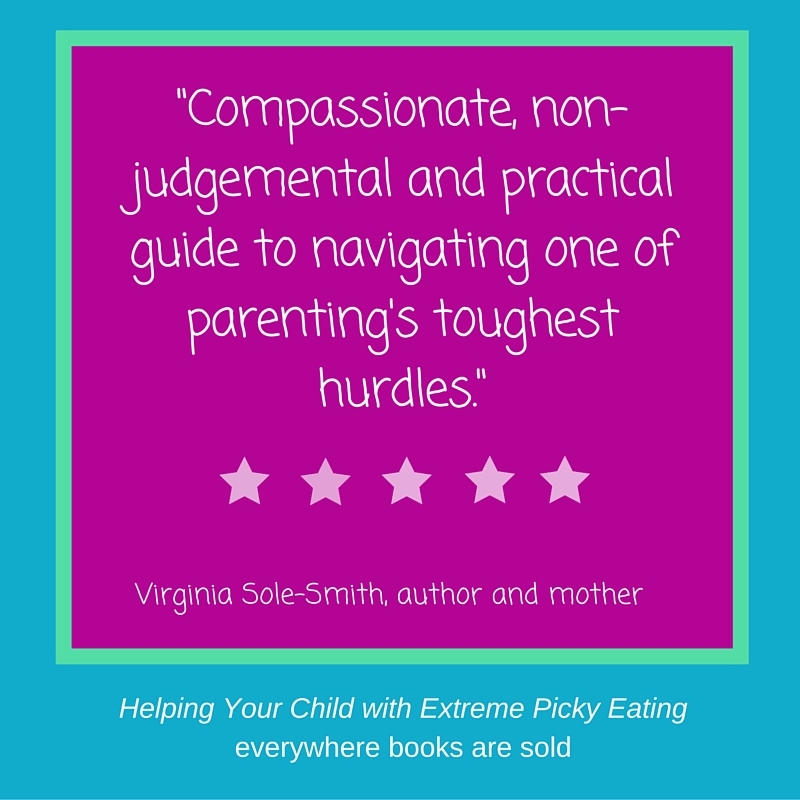 I highly recommend it for all parents, not just those challenged with children who are extreme with their eating. Why didn’t this book exist 8 years ago? As I read this book I seriously wished that I had a time machine and could just go back and do everything over. I would save my son and myself countless tears. I wouldn’t have to see my son vomit or gag as I tried to force him to just lick a food. I wouldn’t have to spend hundreds of dollars on toys if he would just try one bite of a food. There would be no more screaming or yelling because I was scared that he would die because I couldn’t get him to eat. There was nothing out there about eating issues like this 8 years ago. Trust me I looked everywhere. My son’s eating issues started when he was an infant. Doctors were clueless. I worked with a nutritionist, two different OTs, psychologist, social worker and even a speech pathologist. I encountered tons of bad advice such as let him starve for three days and he will eat. Force him to drink it, he is winning the battle. The list goes on and on. As I was reading this book I just kept saying this is my son. My son suffered from sensory issues and anxiety. We have also done everything they mentioned on the don’t do list in this book. The other thing I loved about this book is they back up what they are saying with research. Most of which was published after 2006 which is when my son was born. My family has suffered for the past 8 years trying to get my son to eat. I can’t thank the authors enough for finally giving some excellent advice. My son only eats 10 foods. He won’t eat any food from a restaurant. He eats no meat or vegetables. He has also had the same thing for dinner for the past 7 years. This book opened my eyes to some much needed new strategies. It is not going to be easy but I have given up over the past couple of years because I just couldn’t fight with him any more. I am excited to try these new techniques. I also appreciate the advice they gave when dealing with other people who need to comment. I don’t know if the authors will ever read this review but THANK YOU for writing this book! I already feel massive relief to be reading this book. I’ve read so many articles and other books and talked to so many people, but there are so many things to keep in mind when choosing how to feed your child! I couldn’t organize all the information or prioritize its importance or decide where to start. My efforts have been aimless. I’ve changed course a dozen times, given up a dozen times, thought we were getting somewhere and then been wrong a dozen times. My pediatrician, the pediatric GI, the therapist – none of them seem to really hear me or know how to help. Finally, I feel like I’ve found an expert who can tell me what to worry about now and what not to and how to start. 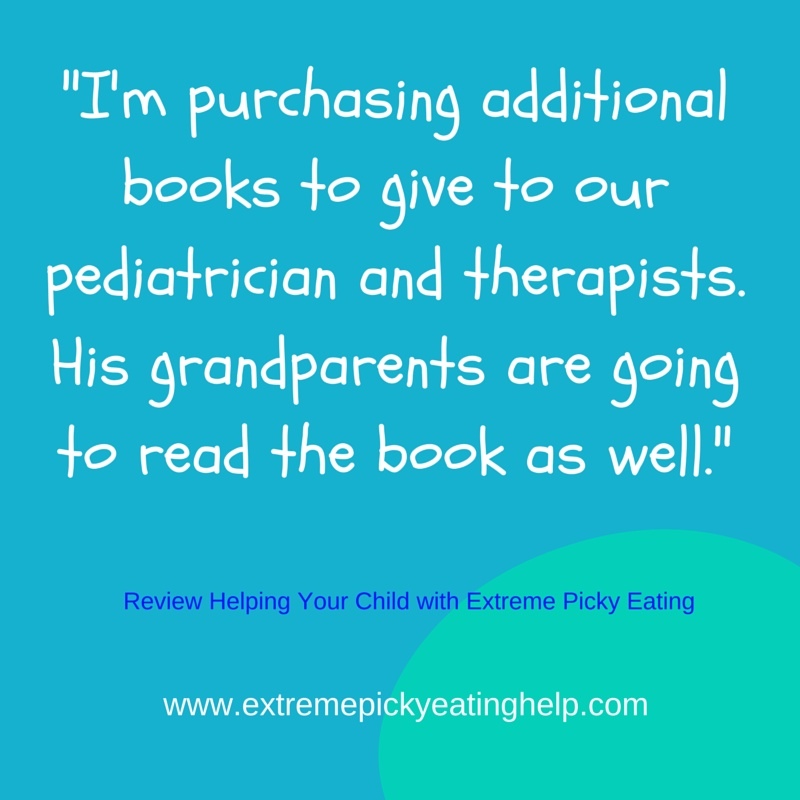 The tone of this book is one of the best parts – it’s both forgiving and non judgmental and also validating that parents are the ones that can expertly guide their particular children out of extreme picky eating. 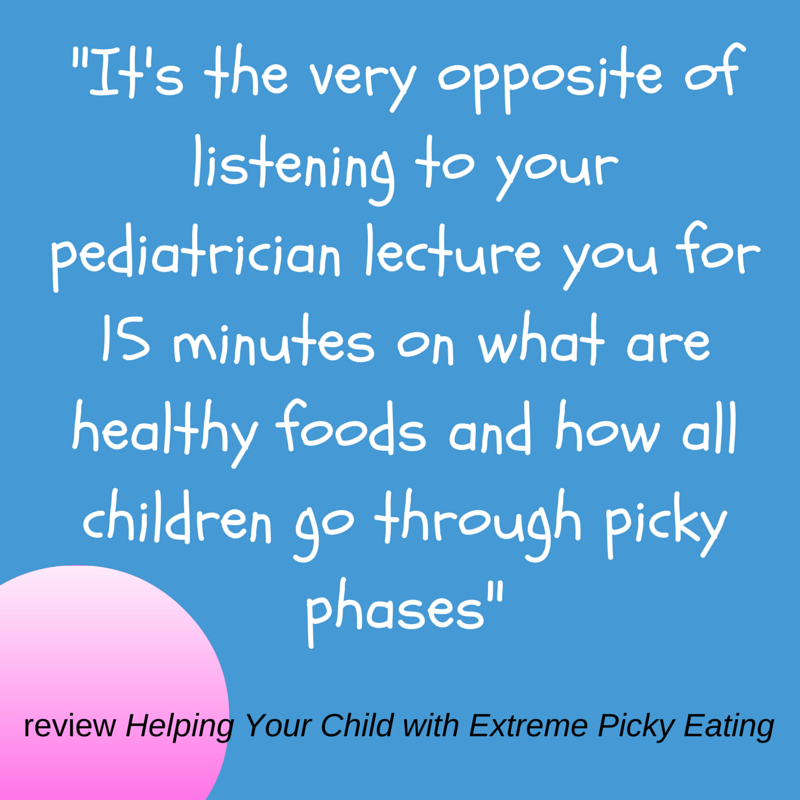 It’s the very opposite of listening to your pediatrician lecture you for 15 minutes on what are healthy foods and how all children go through picky phases. Their solution WORKS. It’s not an overnight solve, but they know how to put you on the right path. I just wish I had found them a few years ago. 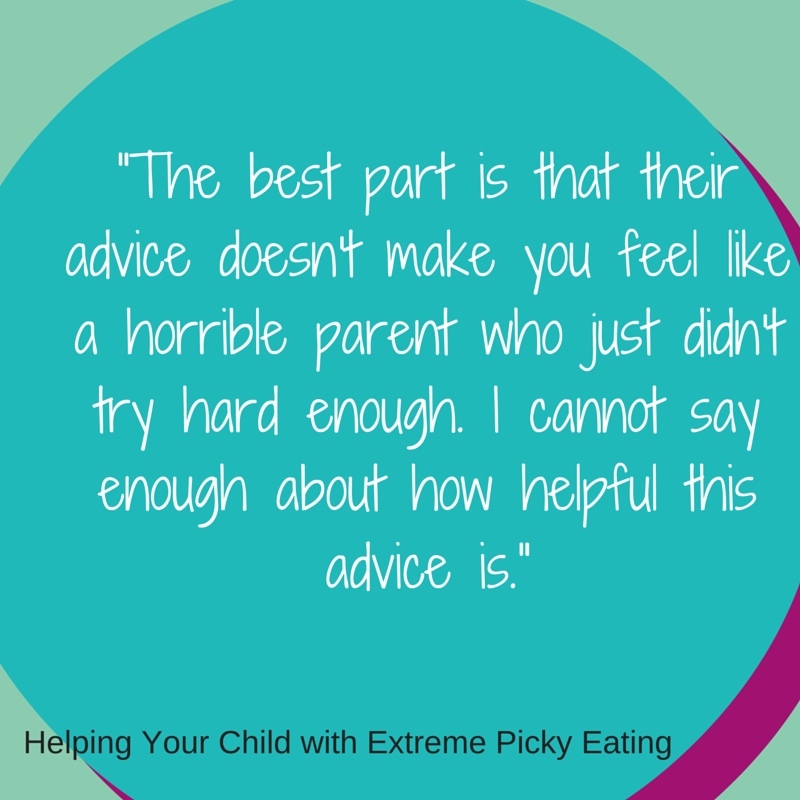 We had so much bad advice, and if we had gotten this advice sooner, I know we would have been in a better place with our child’s eating sooner. If you’re even considering getting this book, just do yourself and your child a favor, and get it. They know what they are talking about, and they have the compassion, the research, and the experience to back it up. As a retired clinical psychologist who dealt with eating issues in children, I regret that this book was not available twenty-five years ago. It is beautifully and competently written to provide reassurance for parents who deal with this difficult problem. Mental health professionals will find it very helpful. After reading, I was able to apply the tools in the book to the dinner table. It has made such a big difference in our time around the table and more enjoyable. Who would of thought just having a family style dinner would make all the difference in the world. So much so, I had to stop hanging out with the family to write this review! Thanks for such a wonderful book! Thank you for writing this book, thank you, thank you. The struggle with our son’s feeding issues have been so hard on him and our family. We’ve been his biggest advocates, he’s two and has been in therapy (OT) since he was 11 months old, but I started asking for help at 2 months old. I’ve learned more from this book than through any of his therapy sessions. I’m planning on purchasing additional books to give to our pediatrician and therapists. His grandparents are going to read the book as well. I would recommend this book to anyone with kids, not just picky eaters, we’ve applied the steps to all of our kids, not just our son. I wish I would have had this knowledge earlier, but so thankful to have it now. This book is so helpful! As a psychologist working with parents and children with extreme picky eating, I will be recommending this book to all families that I work with in the future! Rowell and McGlothlin’s STEPS+ approach combines evidence-based suggestions with practical guidelines that parents can easily implement. As a parent, I have already begun applying advice from this book to enhance the feeding relationships in my own family. The book is rich with helpful takeaways, but my 4 favorites are: (A) Their style — confident, reassuring, expert; (B) the nitty-gritty, day-to-day details — they understand how it is to LIVE OUT the guidelines they are offering; and (C) their suggestions for responses (“you might say something like…”) and (D) the Steps approach breaks down the roadmap into more easily tackled elements. I feel so much less crazy after reading this book and much more empowered to mindfully guide my family in a positive direction. 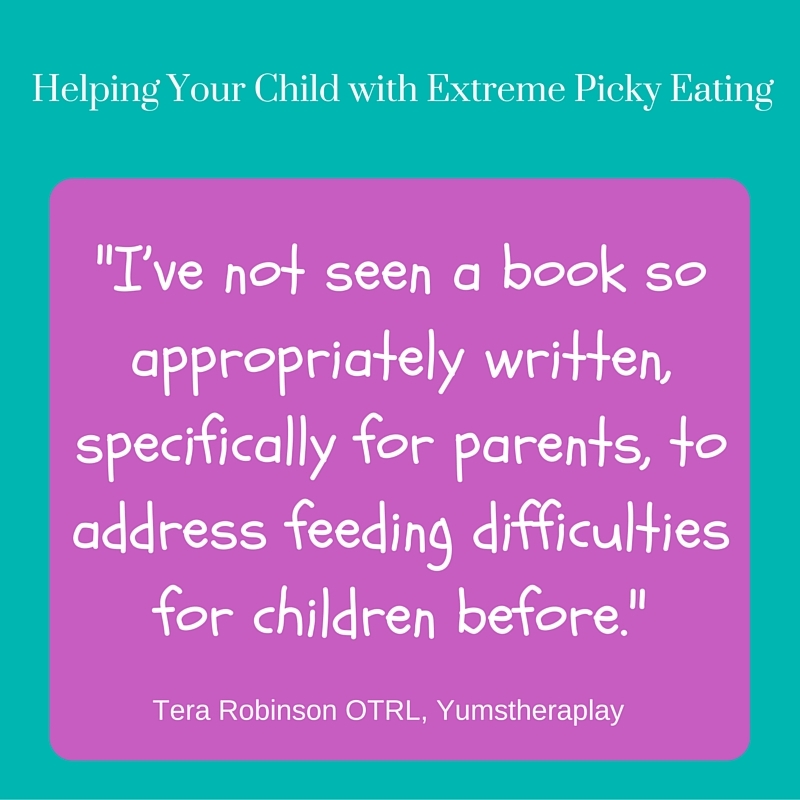 Most kids-eating books are probably fine if your kid is just a picky eater, but if your kid has a true feeding problem, the advice in those books can be really frustrating. “You have to serve the same food 12 times before the child will accept it!” is not the sort of advice that has helped my family. Rowell’s book is the first thing I’ve found that is geared towards kids like mine, and it has been extremely helpful for all of us. I can not say enough about this book! The relief it brought to my husband as I as trusting and advocating parents of a picky eater can not be described. It grants reassurance and comfort that is so needed in a time when no one else seemed to understand our instincts to listen to our child and his needs. I only hope more professionals will read this book and will help more parents through education and knowledge around a very otherwise confusing and judgmental topic. 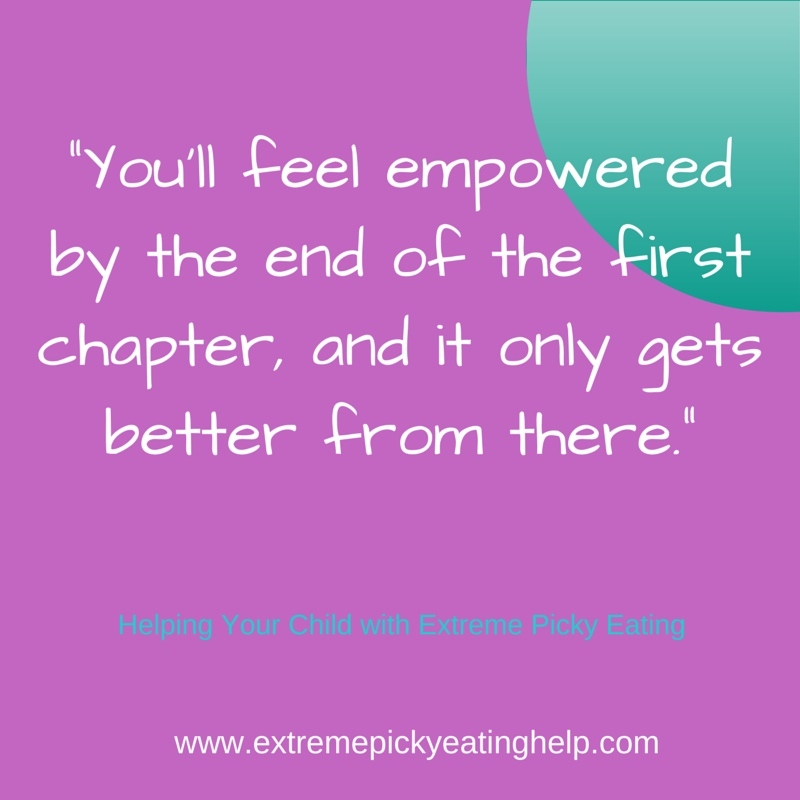 It is especially helpful if you’re at the end of your rope trying to compare your child to better eaters and feeling like you failed. This book is truly a must read whether your child is a picky eater or not it opens your eyes to the myths, and otherwise typical patterns of worry in just about every parent over food. I am so appreciative of the help it offered us, especially the help it gave my son in putting him at ease around meals. Our household is much less stressful around meals and above all it has eased tensions with my son’s school and the otherwise judgmental patterns amongst outsiders all together-friends and relatives included. 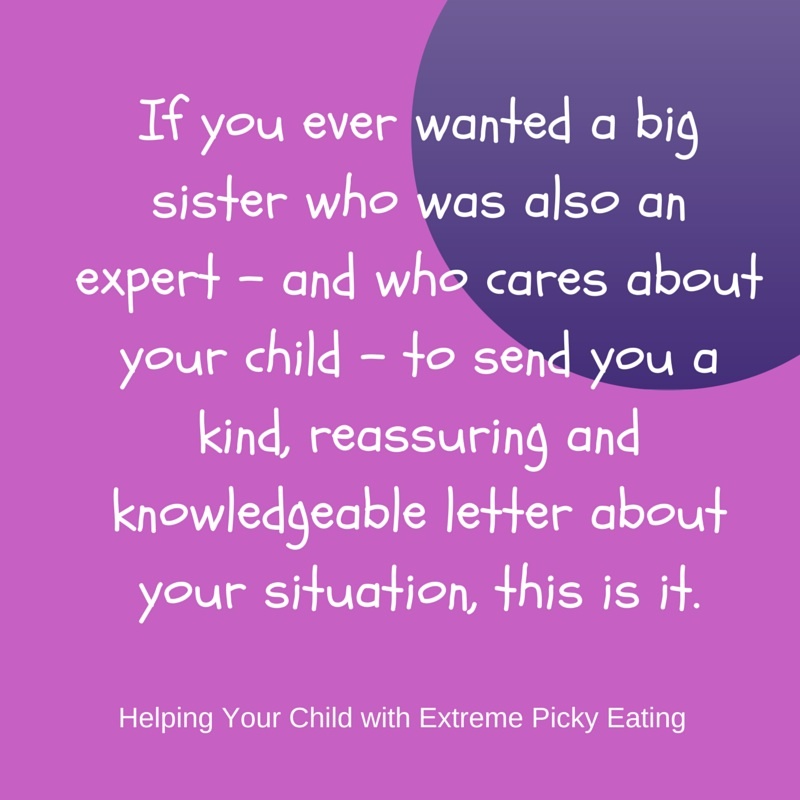 I can go on and on…please read this if you have the slightest fear over food intake and variety…and especially if your child is “picky”, or extreme picky to the fullest like ours when it comes to food.